So I decided to make my own Printable - What do you think? The poem came from this Pin I saw by Mrs. Adventure - Thanks for the Pinspiration! I made this with PicMonkey, using one of their backgrounds and several architectural and ephemera pieces from The Graphics Fairy, along with the witch graphic. It is just the right touch for my mantel! But wait, what is that beside it? Yet ANOTHER $ STORE PUMPKIN ! Really, we all need to get a grip. I bet almost every crafty blog in America has revamped one of these babies ~ but who can resist? They are just begging for a makeover. pumpkins and candlesticks now $#*(&#$&!! These are few of the places that we like to party: Brassy Apple, My Life's a Treasure, Sew Many Ways, DebbieDoo's . For a complete list check out our Linked Up To page. Adorable printable! Great job, I would love for you to share this on super Sweet Sunday at swtboutique.blogspot.com. I wonder where I could hang that! Thanks for the invite Stephanie. We linked up and I'm your newest follower! Thanks Kathy! Really enjoying your parties - so many creative ideas. What a darling printable! I love it! Nice job! Oh, I love both the pumpkin and the print! Too cute! Thanks Susan! I just can't resist those $ store pumpkins! So adorable! Thank you for sharing! Please stop by my blog and add a link to In The Kitchen Thursdays! It could be anything from crafts to recipes! Any creation is welcomed! Following you, I hope you come by and follow! Thanks for the invite Annamaria (what a beautiful name!). We linked up and look forward to the next party! 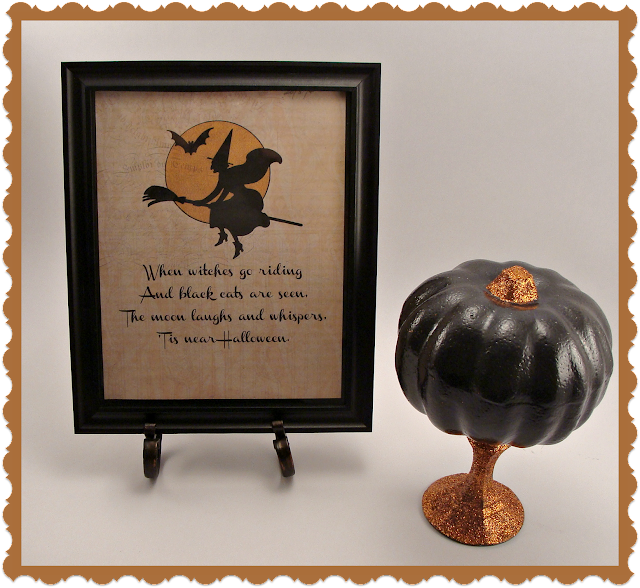 Beautiful printable and perfect for my mantel. Thank you so much for sharing it at my Our Favorite Things Link Party. Have a great week. 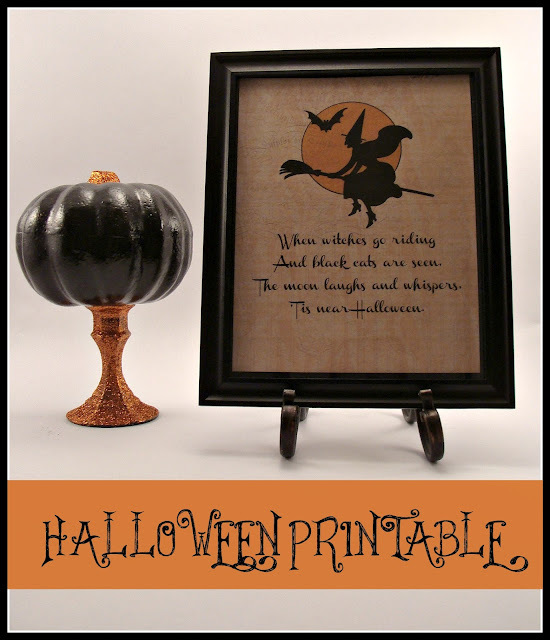 Thanks for the darling printable for Halloween! You made a really fun vignette! I ask you, can we really have too many pumpkins... I think not! Your black pumpkin is very chic on its glitzy pedestal! I hope you will stop by StoneGable and share this fun printable and vignette at TUTORIALS TIPS AND TIDBITS, my weekly linky party. Link goes live Wednesday at 8:00 pm. Thanks Yvonne for the invite. I'm following you now and am looking forward to the party! I do love my $ store pumpkins. Thanks for the printable it is really cute, and love the saving! You can never have too many pumpkins! Love your vignette! Thanks for sharing your inspiration with Sunday’s Best – you helped make the party a success! Thanks so much Sarah! Crafting keeps me sane in a crazy world. I'm following you now too and look forward to seeing all your adventures with that adorable daughter of yours! Thanks Tracy - I may not be very original, but I'm a great copy cat! Happy Fall! Thanks for sharing a great printable. Love the verse. OH another awesome pumpkin idea. Like the glitter. Dollar store pumpkins can't be beat! Thanks for dropping by to see us. Hope you come back often! Thanks so much for the invite Kathryn! Linked up and am your newest follower. Looking forward to the next party! 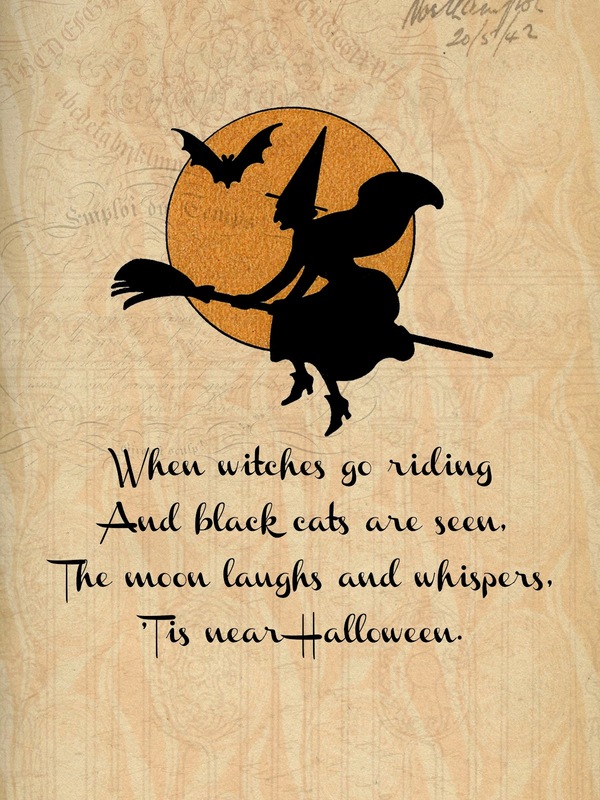 What a cute printable for Halloween! I'll definitely use this in our decor this year. I like the background you used. It gives it a great vintage look. Thanks for sharing! We love to Party! Thanks for the invite - looking forward to it! That is super cute! I love the entire vignette. Thanks for sharing. You printable looks great!! Thanks for linking up at Romance on a dime. 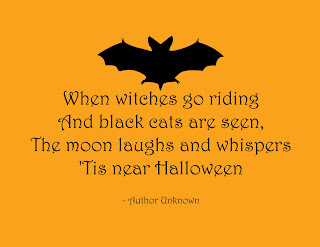 Nice job on the combo, I like what you did with the witch and the poem. They came together great! 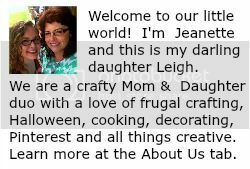 Phyllis, after looking at your beautiful house and very exotic house sitters, we are honored that you are using our little printable!!!! I've got to get my hands on some of those skeletons you have! They would be perfect for our Halloween Party this year! Thanks for the kind comments! And I'm following you now via Bloglovin! I adore your witch print and can't wait to print it out for my home. I've already pinned it and shared it on my FB page. I also love the way you glittered the candle holder for your pumpkin. This is another idea that I just may have to copy. Thanks so much for joining Throwback Thursday this week! Thanks Paula for sharing our printable! As you can tell, we just love Halloween over at Crafty In Crosby! I'm following you now via FB and Bloglovin and look forward to seeing all of your creations! Adorable! 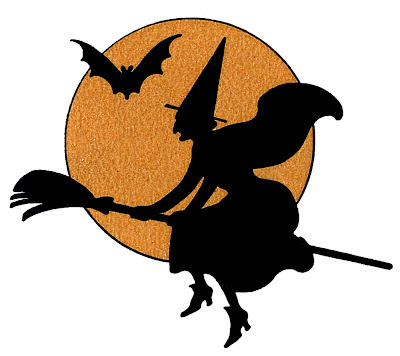 Glad you brought your Halloween printable to Throwback Thursday! Jill, we are Halloween fanatics out here in Crosby and we've made another convert! LOL!!! Hope you enjoy it on your basement mantel. Come back soon! 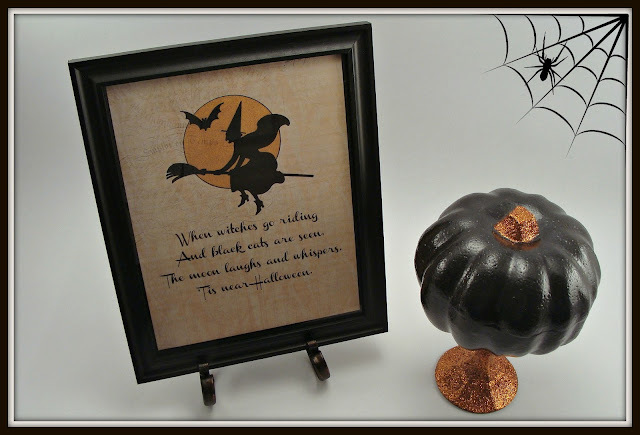 Jeanette - I'm featuring your cute printable in a Halloween round-up to be published on 10/17. I hope you'll stop by to comment and share! Thanks so much for letting us know! We are very honored and can't wait to see your round up! I love this & thank you!! Might have heard it so many times already ~~~ But not from me! ;) And I really mean it! It is perfect - and will make a nifty housewarming present for new neighbors moving in next door this past week! and they already hung a very cute witchy wreath - so this will be welcomed I bet! :) THANKS! Wow! Our printable as a gift! Can't think of a bigger honor than this. Hope your neighbor likes it and that you all have a Happy Halloween!